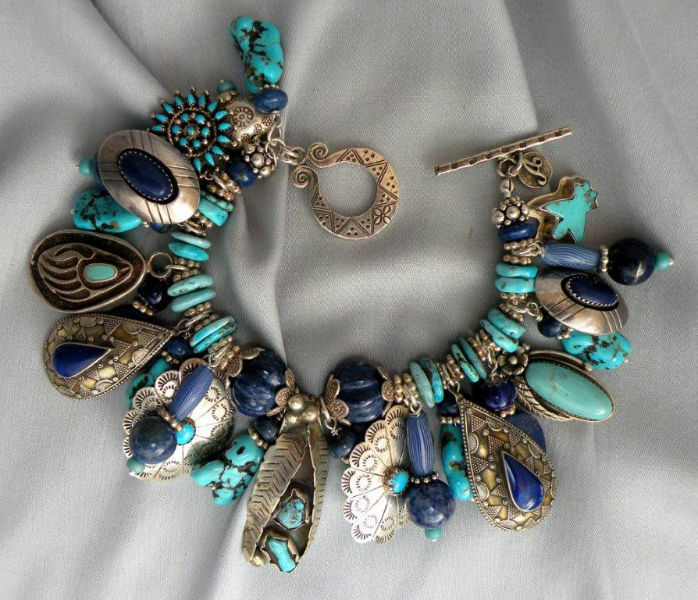 This elegant bracelet is an old friend that adapts itself so easily to a handsome and very special necklace. 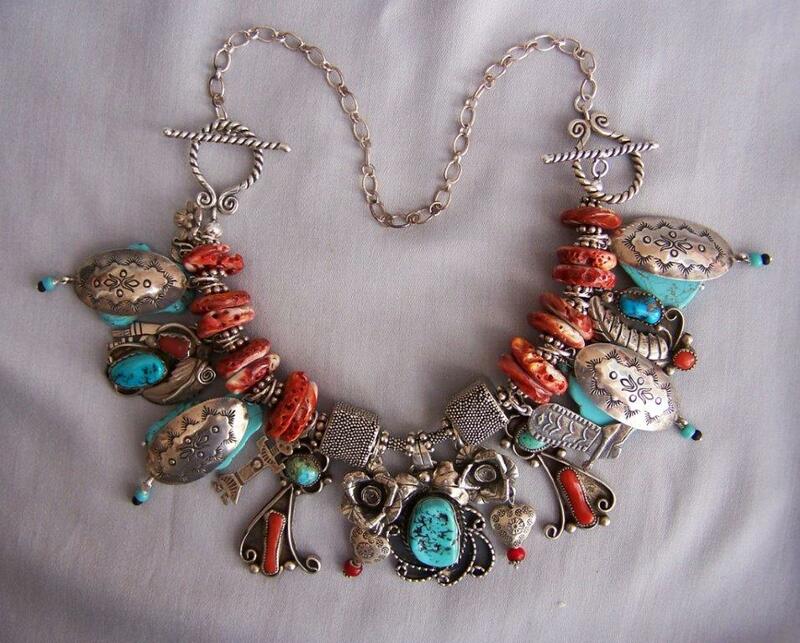 It is an old friend because for many years I have had the antique Navajo long coral and turquoise charms on either side of the focal charm, that add so much to the beauty and authenticity of Navaho craftsmanship, but now its time to share in our new monthly FEATURED ITEM presentation. 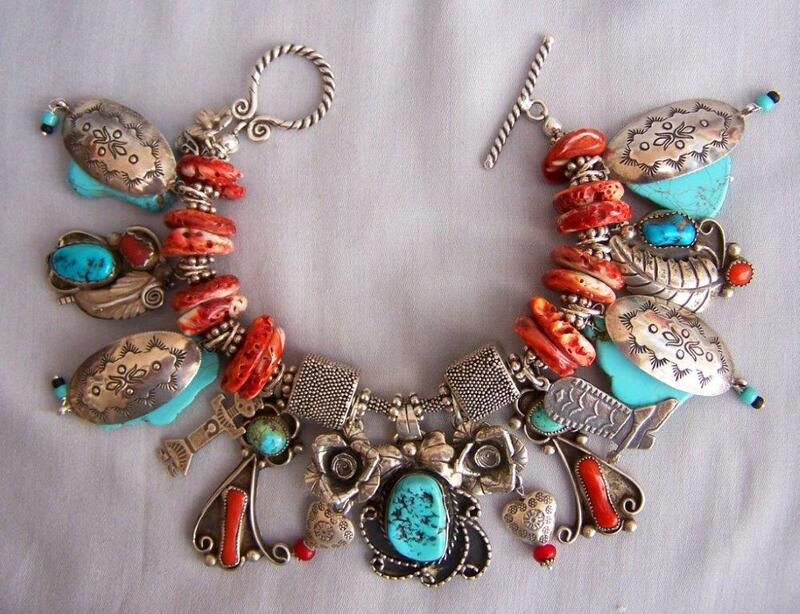 The focal charm in this bracelet/necklace is a vintage and detailed sterling hand made Navaho charm beautifully detailed in swirls of sterling design surrounding the chunky Kingman turquoise stone. It is unmarked in the common old way prior to the 1930s. 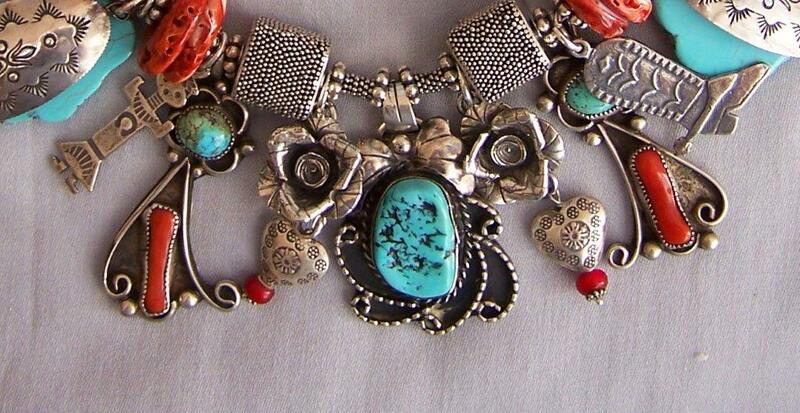 Beside this charm are two rich looking sterling roses each with small detailed hearts dangling below, then the old turquoise and coral Navajo charms, then four slices of turquoise stones and four vintage hand stamped sterling concho charms with little dangles. 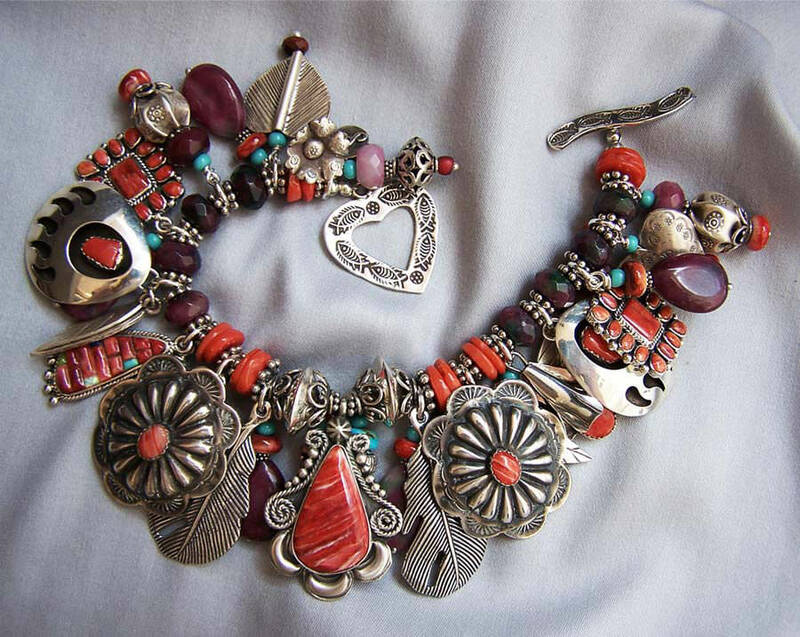 I’ve added two more hand made vintage sterling coral and turquoise charms, one marked, and a scatter of sterling charms, including an Indian with a feather bonnet, a cowboy boot, and two Kachinas. 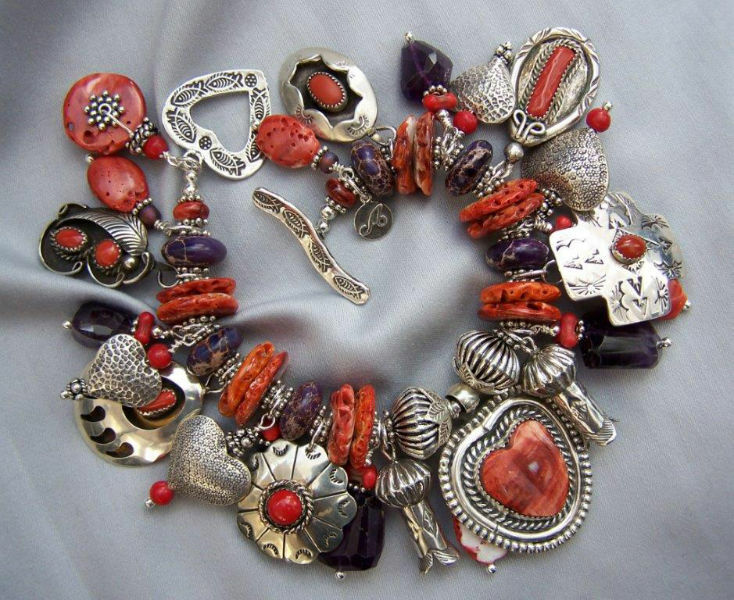 The band of this bracelet is made with discs of natural red spiny oyster with two important square sterling silver center beads. 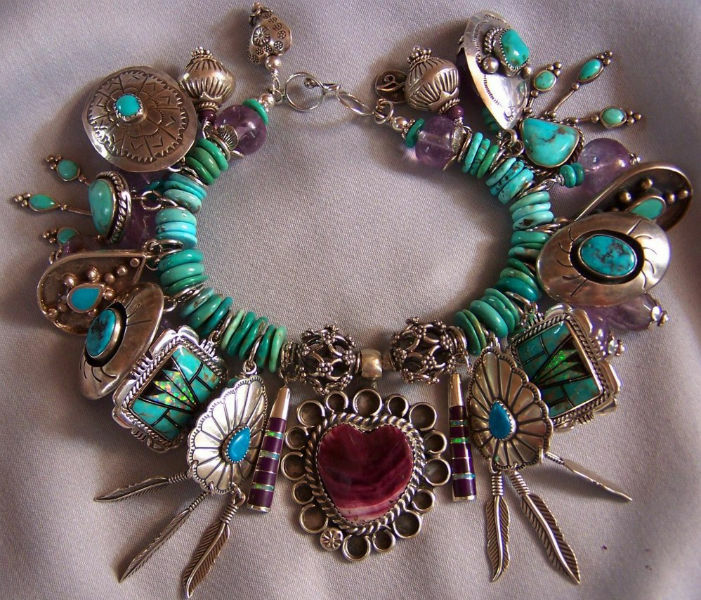 The bracelet is about 7.5″ wearable length and the clasp is a sterling toggle clasp that is large and easy to use. Adding the chain makes this a lovely 17″ necklace, which can be adjusted larger or smaller to your special requirements.